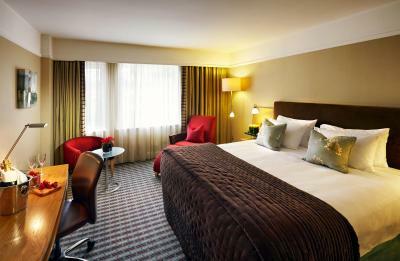 Lock in a great price for The Croke Park Hotel – rated 9.1 by recent guests! 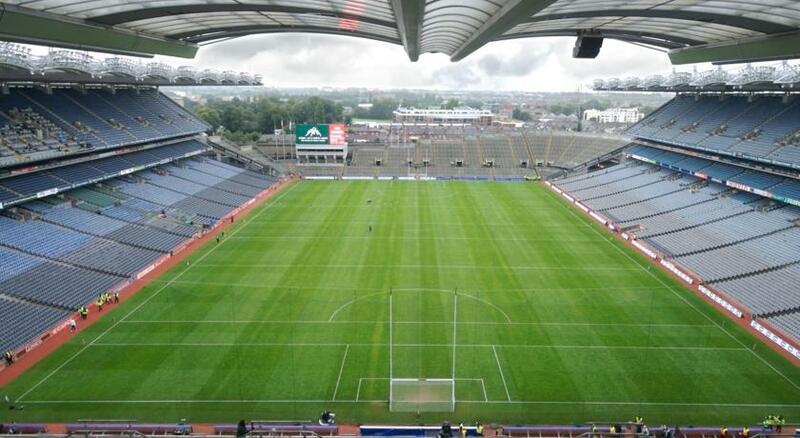 Quiet location (when Croke Park is not hosting matches of course). A bit off the beaten path. Very clean, good rooms. Dining in neighborhood was limited - one decent Italian restaurant nearby. Breakfast buffet is not great and very pricey (17 Euros unless booked in advance when it is 14 Euros). Probably with staying on 4th floor with much better Executive breakfast. Very friendly helpful staff. Easy, free parking with easy access to North and Airport. Good hotel but a bit pricey for its location. The staff were very friendly and accommodating. The hotel fulfilled all of my needs for my short stay. Good selection of cooked items for vegetarian at breakfast. The staff was outstanding. Greeted at check in with a smile and staff always willing to help with any question or request. The hotel was going through a renovation so part of the dining facility was unavailable but the wait staff worked extra hard to make the trip enjoyable. The breakfast buffet was nice and fruit was very fresh. Staff was also very friendly. Room was clean and comfortable, staff friendly, breakfast a little disappointing expectations were higher! Wonderful staff - the friendliest we have ever encountered in a hotel! 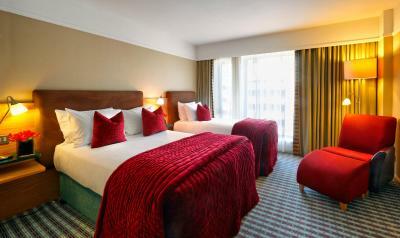 Lovely hotel with very comfortable and spacious rooms and a great location. Highly recommend! Room was bright and comfortable. Bed and pillows were very comfy. 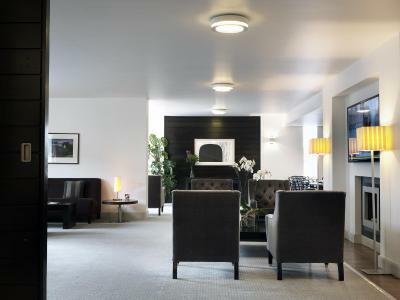 Staff were extremely helpful from reception to staff on door on my arrival. Staff members on the corridor were very helpful when my key card would not work. The person bringing breakfast to room was friendly helpful and polite. 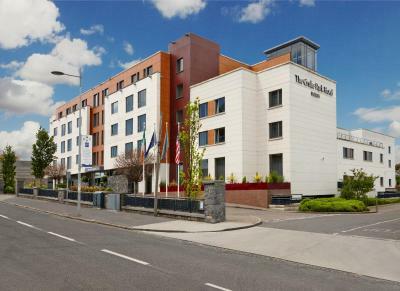 The Croke Park Hotel This rating is a reflection of how the property compares to the industry standard when it comes to price, facilities and services available. It's based on a self-evaluation by the property. Use this rating to help choose your stay! One of our top picks in Dublin.Opposite Croke Park Stadium, this luxury 4-star hotel features spacious rooms with 50-inch Smart TVs. 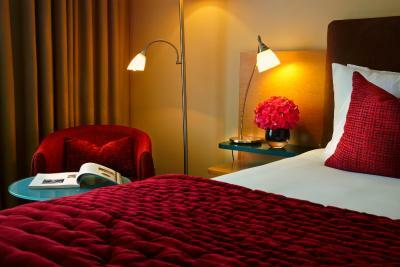 Guests can enjoy hot towels on arrival, free parking, and a European bistro. 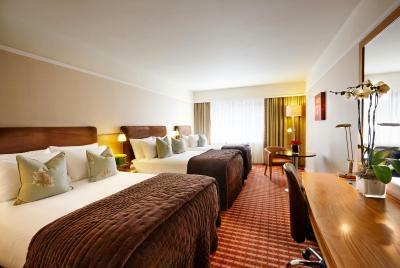 Luxuriously furnished, each room at Croke Park Hotel features comfortable beds with duck down duvets, and a private bathroom with deluxe toiletries. 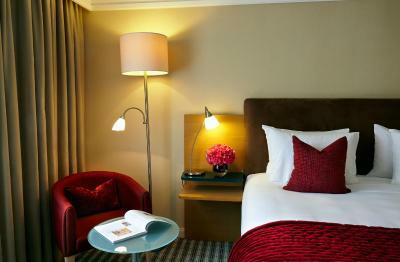 Rooms also feature a mini entertainment system and free Wi-Fi. Sideline Bistro serves modern European cuisine made with fresh ingredients, with chefs cooking from center stage in an open kitchen. Guests can also enjoy fresh coffee and pastries at the coffee bar. Dublin Airport is 15 minutes’ drive away, while the National Botanic Gardens are a 25-minute walk. Connolly Metro Station is 15 minutes’ walk, while Trinity College Dublin can be reached in 25 minutes on foot. When would you like to stay at The Croke Park Hotel? 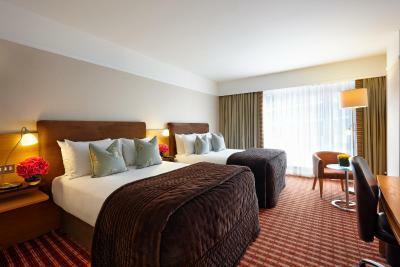 Features sumptuous bed, duck-down duvets, a 50-inch Smart flat-screen TV and an ergonomic work chair. 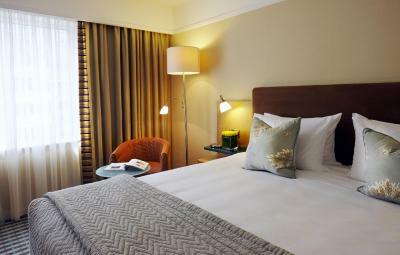 Rooms also include mini entertainment systems and fabulous bathrooms with deluxe bathroom amenities, as well as task lamps, a computer safe and a hairdryer. 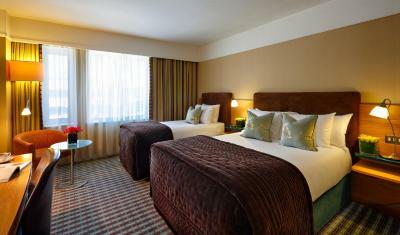 Features sumptuous beds, duck-down duvets, a 50-inch Smart flat-screen TV and an ergonomic work chair. 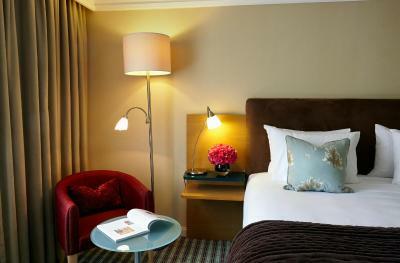 Rooms also include mini entertainment systems and fabulous bathrooms with deluxe bathroom amenities, as well as task lamps, a computer safe and a hairdryer. Deluxe room, providing an evening turndown service, 50-inch Smart flat-screen TV, fluffy white bathrobes and slippers, and free fruit and water. 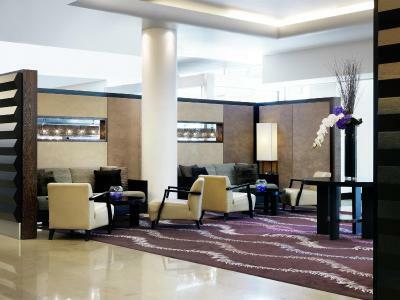 Guests can enjoy a daily newspaper of choice, business magazines, and access to the Executive Lounge, with complimentary continental breakfast and refreshments, Wi-Fi access, free boardroom usage, and complimentary evening drinks. 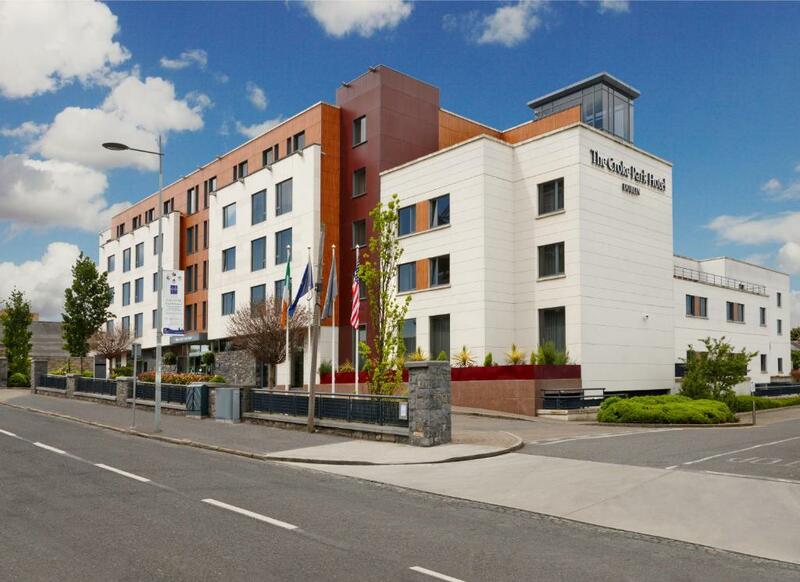 The Croke Park Hotel, a member of The Doyle Collection, has been open for seven years. Many of the management & staff have been with the Hotel since the doors opened, which highlights the passion that our close knit team feels about delivering first class, luxurious & memorable service to our guests. House Rules The Croke Park Hotel takes special requests – add in the next step! The Croke Park Hotel accepts these cards and reserves the right to temporarily hold an amount prior to arrival. The staff were very friendly and offered help whenever you needed it. Excellent service. A swimming pool would have been fabulous as I had children with me. The bed & pillows where really comfy, so was the headboard!! Plenty of storage space. Bathroom had a shower & separate bath. Ice dispenser at the bottom of the hall. Tv was at least 50”. Mini bar in the room with complimentary water on the table. Room had a safe & you could leave your valuables with reception. Car park has barriers & a security guard working. There wasn't much not to like about the Hotel in all... Just thought for the price of the room that at least a breakfast would have been included.. €14 a head to add breakfast to our booking after paying €190 for the room.... I've stayed in nicer hotels that were cheaper and had breakfast included. The location of the Hotel was good.... Although not centerally located... About 20 minutes walk to the centre of Dublin.. same to the bus station.. plenty of transport links in the area if walking isn't your thing... Staff were really nice and helpful..
After an initial problem booking in, the problem was rectified immediately. In fact, the gentleman at reception exceeded our expectations with how he resolved the issue. The bath towels were nice and big and fluffy The staff were very nice from check-in to check out. Staff, facilities, location, cleanliness, quality toiletries, breakfast, lunch and dinner were all good. The shower was excellent with a good sized cubicle, plenty of hot water and great water pressure. 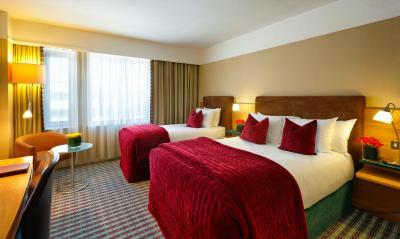 Top class hotel in every respect, from the food, cleanliness, central location and value for money. Will definitely be back again. Lovely hotel, I would highly recommend staying here. Looking forward to staying again. I have stayed at this hotel many times over the past 3 years I am happy with everything. I will continue to book this hotel throughout this year and beyond.